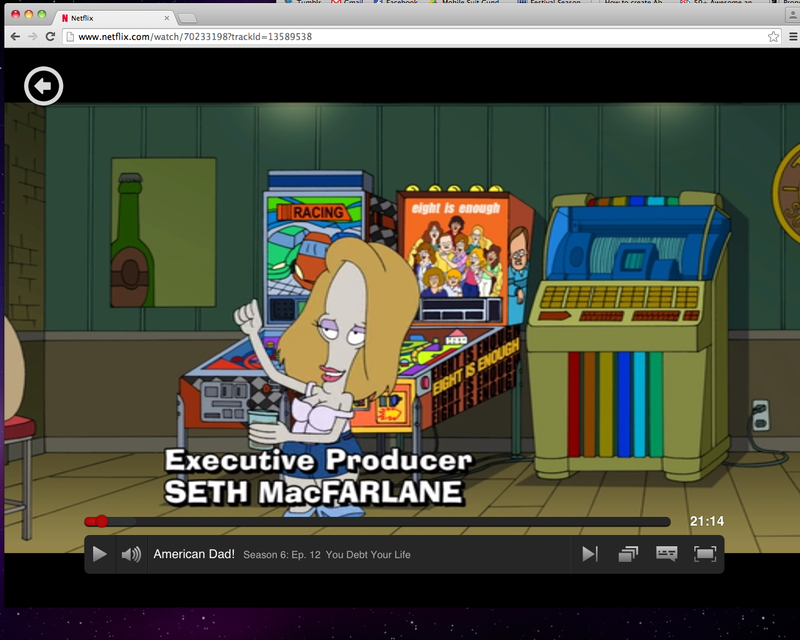 I know I've mentioned this several times, but since I got into pinball, I've been on the lookout whenever I watch tv/movies/etc. for pinball machines. 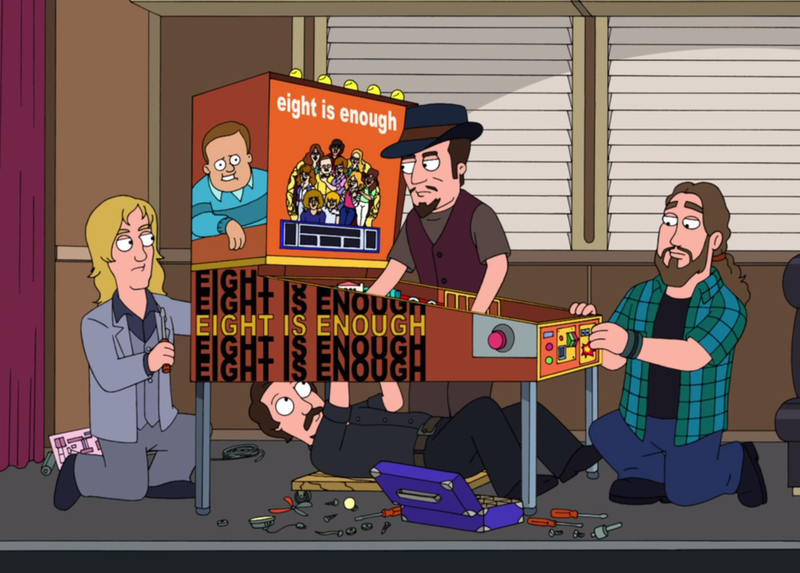 I think it's extra funny when pinball machines show up in animated features, shows, or comics, because (and trust me on this one) pinball machines are HARD TO DRAW! It's really interesting to see how the various angles/proportions/components of a pinball machine are handles. What buttons are included is interesting. 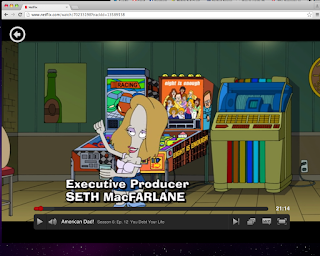 I've seen pinball machines pop up in a couple different episodes of American Dad!, and I thought that I would post them here for posterity. This is a pretty serviceable image, but I don't know what's going on with the front of the cabinet? I see the coin mech, but then there are is a lot more mechanical whatnot just stuck on there, like the control panel of Buck Rogers' starship. Ha ha, what!? Is there a plug on the back of the machine? You could plug something into the pinball machine? The legs are pretty funny, and the simplified machines in the background kill me. Anybody have a guess what they are referencing? 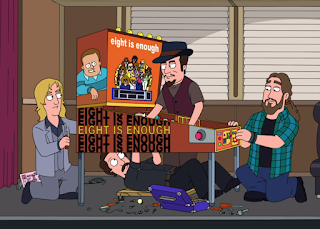 The "Eight is Enough" pinball machine actually showed up in two episodes. That game next to it is either supposed to be Stern's Nascar or Bally's Indianapolis 500 or Bally's Corvette. Racing: The game where several opponents vie for position in a competition of speed! Now with cars! DTZ Shirts Available for Online Ordering! If you haven't seen, there is a tab at the top of this blog that says DTZ extras! There, you will find information on how you can order your very own DTZ shirt! Check them out! 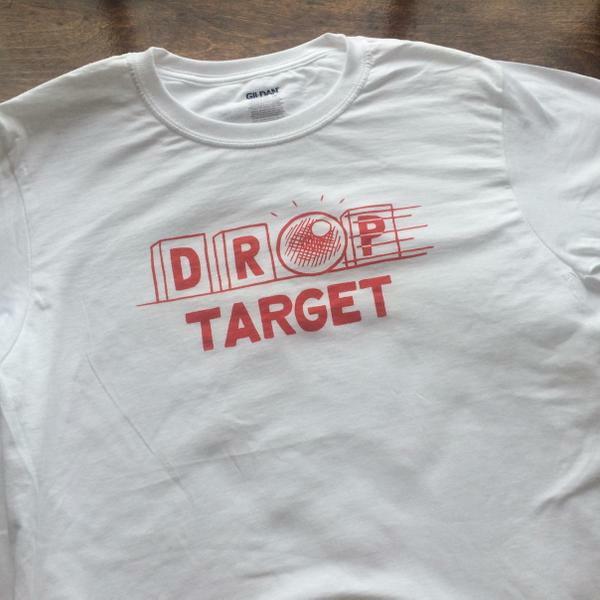 Show your DTZ love with a Drop Target shirt! Handmade by Jon Chad in the summer of 2015 to commemorate the last issue of DTZ. The shirts come in Small - 2XL. Email Jon Chad at jonchad [dot] comics [at] gmail [dot] com to check on shirt size availability. Each one costs $10 + $3 shipping. Drop Target #7 is now available for online ordering! Well, a few boxes of Drop Target #7 arrived at my new place today. It happened to also be the day I got my internet connection set up. This seemed like serendipity, so I'm putting them up for sale... TONIGHT! You can head over to the DTZ #7 page to order a copy. Below is a rundown of all the goodies in this, our final issue. First Printing: 8.5" x 14" full-color centerfold, screenprinted cover on metallic silver paper! - TILT TALK: Gerry Stellenberg / P3 an interview by Ryan Claytor! 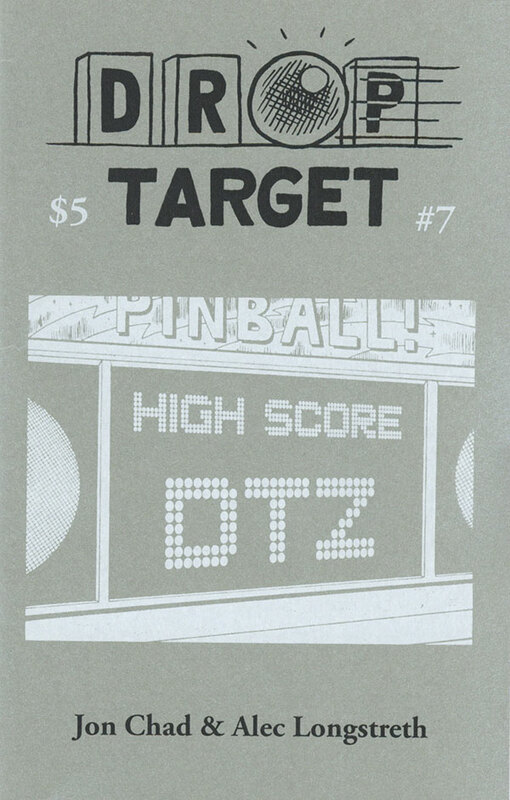 Although we are wrapping up the zine, our pinball adventure is far from over! 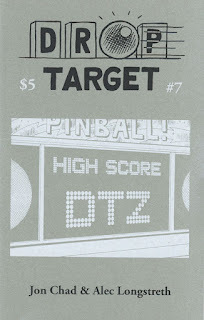 We still have a few pinball publishing projects in the pipeline and if anything, the pace of this blog might pick up a bit now that we don't have to put together the next issue of DTZ. Thanks everyone for your wonderful support over the last five years. It has been an amazing experience for both Jon and I, and it has been a blast sharing our enthusiasm for pinball with this incredible community!